u r no where for me!!!! u r killing me like a devil. u had broken my heart . i know there r no hopes for this janma. Re: baba r u thr? Welcome to this awesome online mandir of our Babasai.It is Baba's choice that you are here trying to find answers for your questions and it is only a matter of time that you will get all the answers. You are searching for Baba everywhere,but never tried to look into your heart.Baba is very much there.Check the screen name you ahev selected.A daughter can never hate her parent.When you say so many times that you hate him,it means that you remember him always and love him more than anybody else.It is your present state of agitated mind which is putting an iron curtain in front of your eyes that you are not able to see him right now. Baba always wants his children to grow stronger and you would also agree that no parent wants weak children.So Baba wants us to grow through all the challenges in life. Dearest Sister ,Will you do it. Welcome to our Sai online mandir. 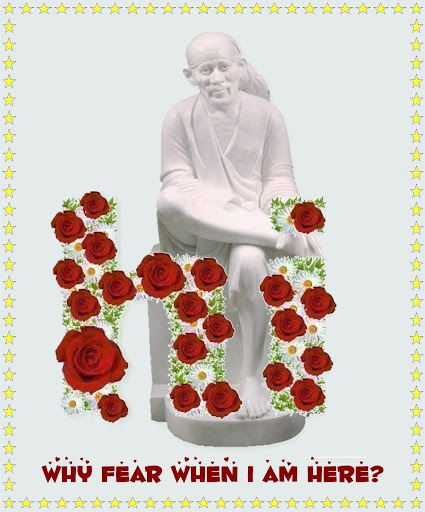 I am sure our Baba Sai loves you very much. all His devotees hence you are here in this online mandir. We will all pray for you SaiRam. welcome, dearest Saiputri, to this blessed online SAI family. Our awesome dearest brother Raj has said it all. Just one thing I'd like to add: The way you are fighting with BABA (remember He loved wrestling) gives HIM the chance to hold you even closer in His warm strong and tender arms. May you feel held like that and feel the rush of HIS love and be showered with HIS blessings. How aptly sister Astrid and brother Raj have told. Yes Baba will hold you in his warm and strong hold. May Baba be there always with you. Page created in 0.196 seconds with 43 queries.